One of Ritter's most personal -- and pained -- records stands as one of his best. Spent some time down there myself." In 2011, Josh Ritter's marriage ended. I don't know why, and even though the Internet could probably tell me in a breathless nanosecond, I don't feel compelled to find out. That's their business. 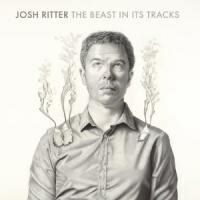 However, Ritter has released The Beast in Its Tracks and admitted upfront that it's his break-up album, the result of an 18-month songwriting binge. So he's putting it out there, and it seems a safe bet the album might contain a few clues as to why the marriage didn't last. Beyond that bit of voyeurism, though, is the question of just what a Josh Ritter breakup album sounds like. Ritter's a craftsman. His best songs, such as "Temptation of Adam" or "Girl in the War", are so seamless and precise that listening to them is like sitting in a room that starts out with a few pictures on the wall. After you sit there a while, though, maybe listen to the song a few more times, a secret door opens up that you never noticed before, or a drawer slides out where you would have sworn there was only woodgrain. This goes on for a while and pretty soon, complexity is staring you in the face when you thought you were just sitting in a chair. Ritter doesn't waste words, and when he does give himself over to emotion, it's usually in a joyous fashion as he revels in "singing without knowing the words" or the belief that "a bar with a jukebox with you on my arm / Heaven and earth are pretty much the same." Granted, Ritter has songs about lost loves and people on the bad side of decisions, but to watch Ritter sing most of these songs onstage is to see joy in the creation of a song, of bringing something from nothing. But what about when something becomes nothing, when something that was real and concrete is nothing more than memories and ghosts? In Ritter's case, it apparently flooded him with songs and, rather than question it, he opted to turn many of them into The Beast in Its Tracks. For the most part, it's a spare album, unconcerned with the epic scope that Ritter usually goes for. It looks inward, free of historical and literary allusions, concerned with only the present and how it compares to the past, and to the realization that your perception of the past isn't set in stone. Unlike a lot of breakup albums, Beast isn't stuck in the amber of the relationship as it disintegrates, or in its lonely aftermath. Instead, we often find Ritter singing from the vantage point of his new relationship. In "New Lover", he sings, "I got a new lover now, she knows just what I need / When I wake up in the night, she can read me back my dreams / And she loves them, though she never needs to tell me what they mean". Throughout Beast, Ritter exults in the fact that he feels a happiness that he's never felt before. On the album's tranquil closer, "Lights", Ritter sings as if he's relaxed for the first time -- and a bit dazed -- after his struggles began: "I've got your light in my eyes." Amidst the winter-to-spring imagery of "Certain Kind of Light", he observes, "My new lover is really kind, / The kind of lover that one rarely finds / And I’m happy for the first time in a long time". But these songs also show that Ritter's gift of words can contain some bite above and beyond the satisfaction of telling your ex-wife that you're happier than you've ever been. When Ritter follows up the well wishes of "New Lover" with "But if you're sad and you are lonesome and you've got nobody true, / I'd be lying if I said that didn't make me happy too", you can't help thinking of John Prine's "All the Best" ("I guess I wish you all the best / I wish you don't do like I do / And never fall in love with someone like you"). There are also plenty of spots where you can't be sure Ritter's being as big-hearted as he seems. When he says he'll keep a bonfire lit for his ex (in contrast to the measely candles that other men burn for their lost loves), you can't help but wonder if he might have a nefarious use for that bonfire if she ever showed up. But what does it all add up to, apart from Ritter getting some catharsis? Well, for one thing, Ritter hasn't sounded this loose in quite some time. The flip side of his obsession with crafstmanship is that his lesser songs can occasionally sound a little labored. As much as I enjoyed much of 2010's So Runs the World Away, there's a tightness to many of the songs that bears witness to Ritter's claims of severe writer's block at the time. On Beast, Ritter sounds like he's going with the flow, and if several arrangements sound like they came from the Paul Simon songbook, or if "Nightmares" walks in the shadows of Sting's "Love is the Seventh Wave", or if "Joy to You Baby" would make a fine U2 b-side, then so be it. The lyrical journey is the important thing, and some of the best -- and most personal -- lyrics Ritter has ever penned pepper Beast. There's still craft here in the way Ritter revisits themes and images from song to song, but it's been a while since Ritter sounded this at ease. Beast is so unassuming, though, that it's easy to underestimate it. Chalk that up to Ritter's trademark smoothness, and his unwillingness to let the heart on his sleeve turn that sleeve too ragged. Taken individually, some of Beast's songs come across as minor Ritter tracks. Taken as a whole, however, the album stands as an impressive document of Ritter's journey through an emotional storm. By the time he closes the album by singing "If I never had met you / You couldn't have gone / But then I couldn't have met you / We couldn't have been / I guess it all adds up / To joy in the end", it sounds like hard-won and well-deserved clarity.